Ghrelin is a hormone manufactured in the stomach lining and its job is to stimulate the brain to know when to eat. It is also known as the “hunger hormone.” The hormone arouses the portion of the brain known as the anterior orbital frontal cortex. 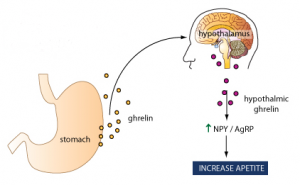 Ghrelin is considered to be a counterpart to the hormone leptin. Leptin is made by fat tissue and increases when the body satisfies hunger. The levels of ghrelin in the body continually rise and fall throughout the day. It increases in the body prior to eating and then declines after eating. High levels of ghrelin hormone in the body make you crave high calorie food. This is because ghrelin affects how the body views the pleasure of food and high calorie foods tend to be more pleasurable than lower calorie food. Surprisingly, obese people tend to have lower levels of ghrelin in the blood than non-obese people. People suffering from anorexia have higher levels of the ghrelin hormone. This leads scientists to believe that ghrelin is inversely related to caloric intake. One study showed that as people lost weight their ghrelin levels increased so although ghrelin may prevent starvation it does not play a role in obesity. Diet also plays a role in ghrelin levels. Research has indicated that eating a diet high in protein keeps the ghrelin hormone levels low while high carbohydrate and fatty diets increase the levels. A study compared people who were given ghrelin hormone before eating a buffet meal. Those given the hormone ate 30 percent more than those who were not injected with ghrelin. Another study showed that if a person is injected with ghrelin immediately after eating their brain tells them they are hungry even though they are full. Pharmaceutical companies are hopeful they can develop a ghrelin blocker. Researchers have been able to successfully block ghrelin in mice and pigs, but are still studying how to do it in humans. One of the problems they are running into is how the ghrelin affects the pleasure center in the brain. If they block this, they may end up affecting mood regulation which will result in bad side effects. An important aspect to blocking ghrelin is to not skip meals. Missing meals results in higher ghrelin levels which tend to lead to higher calorie eating to make up for the missed meal. Watching what you eat and exercising are perhaps the best way to block ghrelin levels. The decision making part of the brain is able to override the stimulation of the portion responsible for ghrelin activity. What this means is a person can choose to eat the lower calorie foods even if the brain is telling it them to eat the more pleasurable higher calorie foods. If you can practice restraint, you can fight what the hormone wants your body to do. Performing 60 minutes of aerobic exercise has been found to suppress the production of ghrelin. This was discovered in a study performed on university students where they did either aerobic or resistance exercise and had their hormone levels checked before, during and after exercising. They also indicated their hunger levels after exercising. Anaerobic or resistance exercise did not have the same effect of lowering ghrelin as the aerobic exercise did. There are several nutritional supplements available on the market that claim to be ghrelin blockers. Some of these supplements include herbs that strengthen the hypothalamus such as alfalfa, parsley, and seaweed. Phenylalanine is also suggested as a ghrelin blocker as it stimulates cholecystokinin, which is another substance that tells the brain it is full. This entry was posted in Nutrition, Weight Loss and tagged ghrelin blocker, ghrelin hormone, what is ghrelin. Bookmark the permalink. This article has very useful information. This is the right choice if one needs complete info in less words.